Forests can be found in almost all regions. Trees are well adapted to grow nearly anywhere on earth. However, if there's a great risk of natural fires or when the local environment is too cold or dry, forests stand little chance. It can take a long time before a new forest forms, but once there, forests can exist for thousands of years. Unfortunately, forests are threatened by damaging human activity like uncontrolled logging and agriculture. Since many forests rely on a very delicate and well balanced eco-system, forest loss is often permanent. Once a forest is lost, it will have great difficulty ever to grow back in that same area. First of all, we need to consume less wood. This is possible by increased recycling and re-usage of wood and paper. As a consumer, buying wood that’s been cut in a responsible and sustainable manner is a good start. Many organisation work on promoting sustainable logging and issuing certificates. 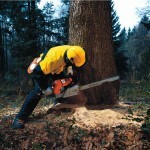 Amongst others, the Forest Stewardship Council has formulated rules for responsible tree-cutting. Wood that’s been cut responsible, can be marked with the ’FSC’ logo to indicate to consumers they are buying sustainable wood. This branded wood aims to save the forests and ecosystems, preventing damage to local animal and plant species. It all comes down to treating our forests in a responsible manner. Two-third of all plants and animals are living in our forests. Thousands of different plants, insects and other animals are depending on forests. We have to stop deforestation, or we risk losing many species like jaguars, bears, tigers and elephants. These mammals depend on sufficient natural territory to survive in the wild. Not just animal and plant species need the forests, people are depending on forests too. They often provide basic needs like food, clean water, firewood and certain medicines. Furthermore, the earth's forests are vital in producing oxygen and absorbing carbon dioxide in the form of carbon in planttissue, thus playing an important role in slowing down global warming. Forests also control rainfall by regulating the evaporation of water from soil. Thousands of years ago, forests covered almost half the earth's surface. We destroyed so many forest area, that only about a fifth of the original forests remain. Most destruction has happened in the last fifty years alone. Imagine loosing an area the size of a soccer pitch every two seconds? Because our forests disappear, we are also losing a unique part of the world's biodiversity. The main threats to our forests comes from cattle ranching and commercial logging. This affects more than 70% of the endangered forests, leading to a huge waste of wood. But there are two sides to the story: forest maintenance is very important for a healthy biodiversity, but on the other hand there remains a high demand for timber the world over. Solutions can be forms of responsible logging, thus preserving the habitat of a wide range of endangered animals and plants.